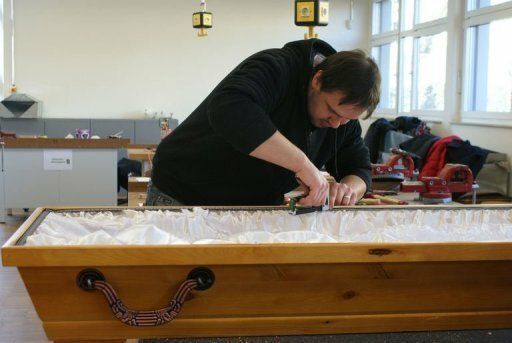 In addition to a workshop, where would-be undertakers learn how to build caskets and properly staple the padding, the school also features a “hygiene room” where they practice on people who have given their bodies to science, mastering the art of washing and embalming dead bodies, so they can be preserved for several days. It also has a small chapel equipped with pews and artificial wreaths, where mock funeral services are held. Students of the funeral academy admit it’s all a bit strange at first, but if you take it one step at a time, you get used to it. Considering Germany is a fast-aging country, where funeral costs vary between €2,000 and €5,000 ($2,700 to $6,900), I guess they feel the benefits outweigh the creepiness.